The iCRT platform is a diverse series of inorganic materials developed by us to cater for the healthcare industry's key challenges. 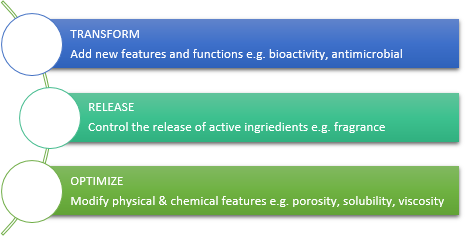 Our platform offers drug delivery solutions, formulation development tools for cosmetics and personal care, and novel materials for medical devices. At Lucideon, we can manipulate materials via novel manufacturing processes and compositions to deliver the chemical and physical properties that your product needs. So our materials are not only unique but we know exactly how to tailor them to suit your product and objectives.